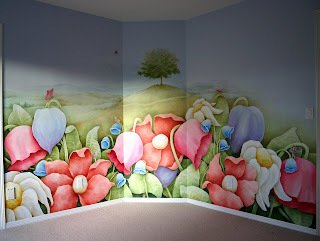 A mural I recently finished for a sweet little girl. She liked lots of pink, so pink she got! 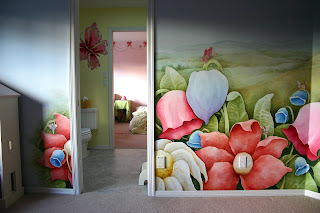 Along with the many flowers and distant landscape I also painted little fairies among the foliage and butterflies here and there to tie in with the room's window treatments (butterfly print). This room shares a bathroom with another bedroom. Rooms I also painted. This shot shows how the three rooms work with each other.